The Google Ventures-backed service has introduced a new POS terminal that supports NFC as well as mobile barcodes and is available free of charge and with no transaction fees to merchants that participate in its payments and marketing programme. 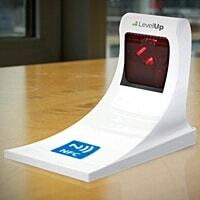 US mobile payments service LevelUp has introduced a new merchant point-of-sale terminal that supports both NFC and QR codes. The move to NFC follows the company’s decision in July to remove individual transaction fees for merchants that use its mobile marketing and payments solution. With the new “interchange zero” concept, LevelUp says, “businesses pay 0% payment processing fees and re-invest those savings into growing their businesses by attracting new customers and bringing them back”. LevelUp is owned by US start-up Scvngr, which has raised US$21m in funding from Google Ventures, Balderton Capital, Continental Advisors, Highland Capital, Transmedia Capital and T-Venture, the venture arm of Deutsche Telekom.